she will perform with the finest Arabic music ensemble and dancers in NYC!!! Zikrayat captures the Cairo Nightclub atmosphere of the 1950's--the Golden Age of Egyptian Cinema--with this late-summer 'BellyDance Dream' performance featuring a lineup of New York's finest dancers, headed by special guest Lale Sayoko. The show will highlight astounding drum solos by California-based master darbukka (tabla) player Faisal Zedan, and include lots of great performances to dance numbers (including new choreography by Mariyah!) that will take you from the Silver Screen to the Nightclub Stage. Zikrayat will finish the night off with great dance music for you, so get ready to RAQ! Tickets are selling fast -- get yours today!! 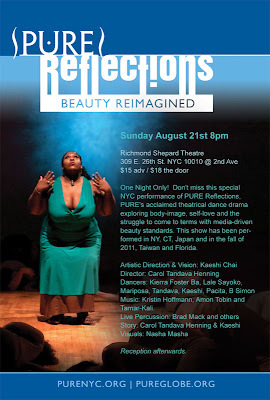 Don't miss this special performance of PURE Reflections: Beauty Reimagined -- http://www.youtube.com/wat​ch?v=aQiRa8yhjjs -- PURE's acclaimed theatrical dance drama exploring body image, self-love and the struggle to come to terms with media-driven beauty standards. Developed in 2009 by the members of PURE-NYC, a multi-level collective of dancers and musicians who strive to bring change, beauty, and awareness to the world through ancient and modern world dance, PURE Reflections has been performed with different casts of over 25 dancers in NY, CT, Japan and is heading to Taiwan and Florida in the Fall. 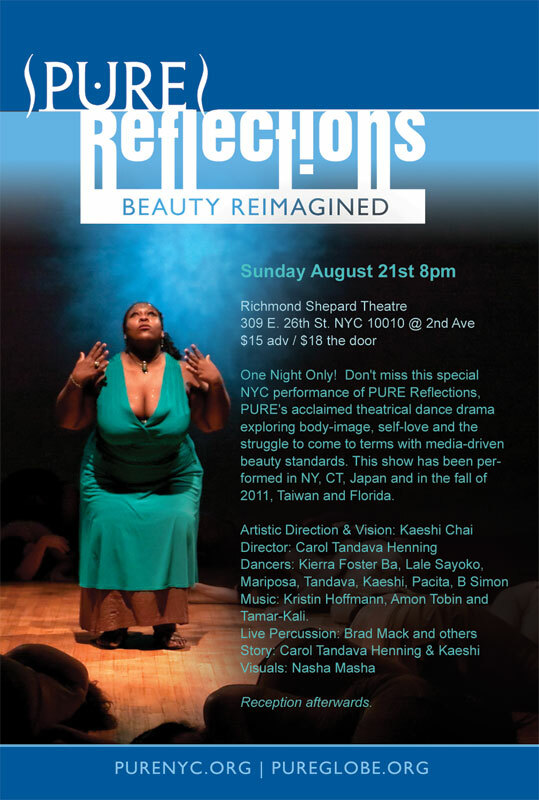 Rooted in Middle Eastern dance (bellydance), while taking inspiration from Modern, African, Flamenco, Butoh and other dance forms, PURE Reflections: Beauty Reimagined is visually stunning, poignantly touching, and deeply thought provoking. Rebecca Rafelson, Vice-President of NOW NY cheers, "It is truly impressive what a positive impact this program has had on so many women's lives. You are all an inspiration!" And don't forget to help PURE win a $25,000 grant from Pepsi!